​The North American invites for IEM Katowice Major closed qualifiers were revealed Thursday by organizers. Eight Counter-Strike: Global Offensive teams from NA will compete in the closed qualifiers, joined by eight more from the open qualifier. As we prepare for qualifiers to begin on October 22nd, here are the invited Americas (NA & SA) teams to the #IEM Katowice 2019 CS:GO Major Championship qualifiers! 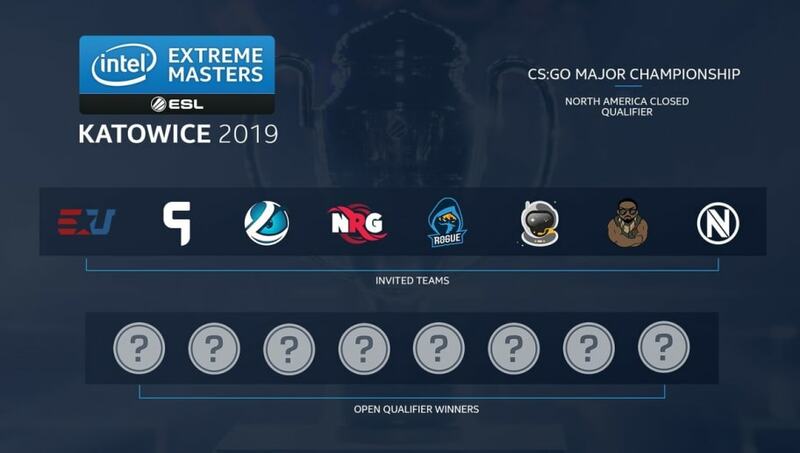 ​​The NA invites for the IEM Katowice Major closed qualifiers were shared Thursday by organizers. For the NA region, eUnited, Ghost Gaming, Luminosity Gaming, NRG Esports, Rogue, Spacestation Gaming, Swole Patrol, and Team Envy were directly invited to the closed qualifiers. The invited teams will join the winners from the open qualifiers to compete for a spot at the first ​CS:GO Major of the year. The closed qualifier invites ​for Europe and the Asia, ​or Oceania, regions were also revealed by the organizers. Registration for the qualifiers are open and will begin as early as Monday. The NA open qualifiers will run until Nov. 27 before the closed qualifiers begin on Dec. 12. IEM Katowice will be the first CS:GO Major to ​feature a live audience during the New Legends Stage.